The west coast of North America is home to one of the most mysterious stinging nettles known, the black jelly, Chrysaora achlyos. Adults are huge, a deep dark purple or black, and very rarely seen. Blooms for this species were recorded only 4 times in the 20th century, in 1926, 1965, and 1989 and 1999 . In fact, when scientists described the wandering goliath in 1997, they chose the latin name Achlys– a Greek figure representing “mist, darkness,and obscurity” . Despite its evanescent visits, the jelly itself is hard to miss: the bell can reach 1 meter (> 3 feet) in diameter, with oral arms extending up to 6 meter (~ 20 feet) in length. The black jelly is closely related to the purple striped jelly, indicated by both DNA and husbandry data. Most stinging nettles can only be housed with other member of their species, because they will eat more distantly related jellies. Black and purple striped jellies can be kept in the same tank, which means they must see each other as being members of the same species. Their DNA sequences are also so similar for some genes it is impossible to distinguish between them [Keith Bayha, personal communication]. One might be tempted to say these animals are different colors of the same species. However, color is not the only thing to distinguish them, they also have differences numbers of tentacles– even as huge adults the purple striped jelly only has 8 tentacles, and the black jelly has 24 . And these differences aren’t likely due to possible differences in environmental conditions, they’re also heritable. Black and purple striped jellies growing under identical conditions in aquariums still develop different colors and tentacle number. More than likely, these jellies share a very recent common ancestor, but have evolved into separate species. Little is known about the life of wild black jellies. In captivity they feed on rotifers, brine shrimp and moon jelly, but their natural dietary preferences remains a mystery. Their polyp stage has also never been observed in the wild. Scientists have no idea where these animals spend most of their lives. However, it does still produce some sting, and the intensity may vary from year to year. If you’re lucky enough to see this species, watching it from a distance is probably the best way to enjoy this bizarre and beautiful jelly. A preliminary phylogeny of Pelagiidae (Cnidaria, Scyphozoa), with new observations of Chrysaora colorata comb. nov. I am not sure that “rare” is a fair description. They’ve been in coastal waters off of San Diego, CA for something like 5 or 6 of the last 7 summers. They show up in late June and wash up on beaches for several weeks. Their appearance is often documented by local media because they tend to be very obvious (large, darkly colored) and a source of concern to beachgoers. Fair point. I was using rare to mean infrequently seen, but obviously they’re quite common at the moment. Great to hear! That has always been one of the things that I found most interesting about jellies, too! A lot of my dissertation work ended up showing that Aurelia sp1 polyps are incredibly difficult to kill. They are super tough little guys. 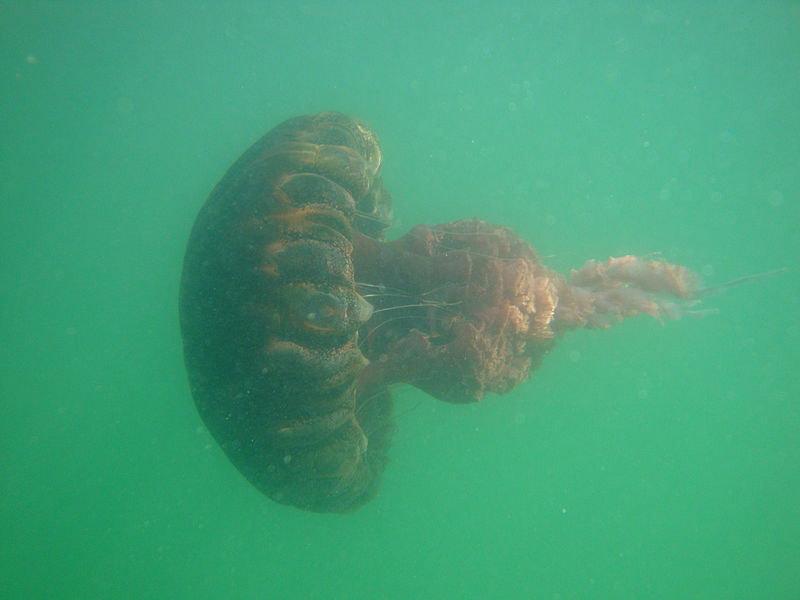 I was already working with Aurelia when the black jellies started showing up in San Diego, but I think that they would have been super cool study organisms. To my knowledge, their polyps aren’t really known in the field, and as you have said, we know very little about their natural history. It would make a great project! There were several other blooms in the 80s and 90s, pretty much all during El Niño events. See the earlier paper prior to the description, pretty sure it’s in the references. Ever since we entered the cold phase of the PDO they’ve been showing up more regularly. Dunno about the mice but quins are weak compared to achlyos. People get nailed in San Diego. We grew up a 50cm class animal back in Jellies Living Art one time, one of the biggest jellies grown in captivity, our 59cm colorata was probably biggest ever grown.